Clip Jacker Review – Is it a Scam or Legit? Earning online money is a dream for most of the people and they are looking for new and new ways make money. There are different ways you can use like affiliate marketing, PTC, surveys, offers, revenue sharing, e-commerce and video marketing. If we look into video marketing then earning money from YouTube is the best way. In order to earn money from YouTube you must create regular videos that are appealing to viewers and if that video become viral then you can earn a good income for years. Similar to this method there is another site which find some new way of earning online. Its name is Clip Jacker and when you reach the home page then you find written there “free software hijacks YouTube video and inject your affiliate links”. This definitely at first site seems appealing to me as it raise suspicions in my mind but as I study thoroughly then it removes my doubts. How to Earn Money from Clip Jacker? Owner claims that it is a software from which you can earn $100 to $200 per month and all that can be done without any website, investment, content creation, experience. 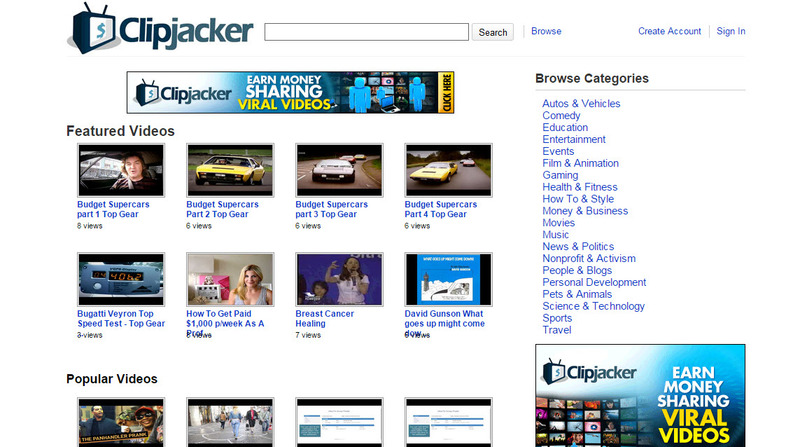 First you need to create an account with Clip Jacker which can be free or paid one. After account creation all you need to embed videos from YouTube to your Clip Jacker member’s area. Then you can place ads there and can earn money. I know there are lot of doubts in your mind but I will clarify this by mentioning more detail. Registration process is very simple in Clip Jacker and even a person with no experience can complete this process easily. Before starting this you must have a Google AdSense and Click bank account because it will be used in the monetization process. Once you have either of these accounts or both, then find good videos on YouTube and embed those in Clip Jacker. It is better to find the viral topic on YouTube because it can spread fast. If you are a free member then you can upload three videos per week and unlimited videos if you are a premium member. Once you upload the video and place ads then your next step is to promote this link and get visitors. When visitors visit your link then there are different ads available with the video. When someone clicks on your ad then you earn money from Google AdSense and when someone buys product using Clickbank link then you will get a commission. Remember if the ads are from Google AdSense then you get a commission from every click as it is PPC (Pay per click) advertising and in order to earn money from ClickBank, the visitor not only click on your affiliate link but also purchase a product from CB site. All payments will be received by you directly because Clip Jacker has nothing to do with your money because Google AdSense and ClickBank sent you payment directly because it is your account. On the other hand, you can create yourself youtube channel and apply for youtube hosted AdSense account. This would earn you $1 for 1000 views. ClipJacker is free to join for everyone and as a free member you can upload 3 videos per month and it is also available to worldwide members. A new way of earning method that can work if you work hard. Getting premium is also very cheap by paying only $17 one time. Very easy to use member’s area and registration process. It is not an easy way to earn money because your main task is to promote your videos which is not easy and if you are a new learner then this is impossible. If you can promote your videos then why come to this ClipJacker and not using YouTube partners program which also pays you for your videos if someone views the same. In order to start this process you must have a Google AdSense account and ClickBank account. Though CB account is not difficult but when it comes to Google AdSense then it requires to have a website that has been around for more than 6 months and are daily receiving at least 100 visitors then they can approve your AdSense account which is not easy for most of the people. Acquiring AdSense account is not easy but getting ban is very easy if you don’t follow their terms and conditions. I have seen lot of videos of ClipJacker that has less than 100 views and you cannot make money by just uploading and people automatically come to see it. If your video also does the same then you cannot earn money except a few cents. In a nutshell, ClicpJacker is not a scam and McCaffrey has taken an initiative to find some new way for earning money and you can earn some money if you work hard. But my problem with this site is same that it is very difficult to promote your videos and when you can do this why not use the YouTube actual platform rather than ClicpJacker. You can test this system by simply joining as a free member and can check for some time whether this system can work for you or not. If you are looking for some legit and long term earning method then see my #1 recommended Program Wealthy Affiliate.